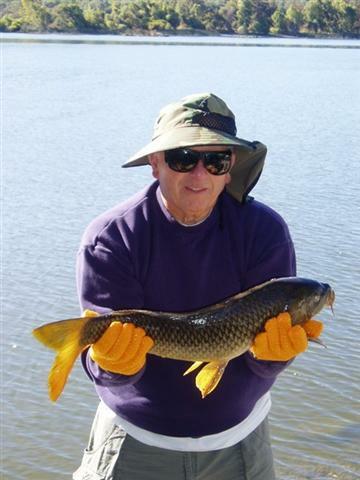 We lost a good person in the pursuit of having carp as a sport fish. Cancer took away his effort on 5/12/12 while he slept. http://norcalcarpclub.com was his pride and joy.We here in nor cal were kept informed and could share our adventures through his effort and support. I for one miss him very deeply He called me friend. May he R.I.P. Thanks guys I installed an Adobe flash "Success"
Not a comtuter wisard Can someone tell me why my computer might not desplay the vedo or what ever images should be showing. Thanks in advance. Your continues input day after day makes me think that something special has to happen to make things come around to your thinking. Some times when a bridge is broken it takes a special part or action to repair. What a great tool the internet do we use it wisely? Just wanted to make a statement about UNCOMMON CARP service. GREAT!!! I ordered a Konic 3.5 ,flyline (Teeny Carp ) an Umpqua flats leader and they assembled on reel with 225 yds free backing. Have heard nothing but GREAT thoughts of same.Ask a question they come up with an constructive anser. I purchased theTeeny Pro Series Carp in a 7wt to use on a 7wt 10ft Sage GFL 7100-3RPL Want to thank all for your constructive input on gear and flies. I think some times the chase can be as exciting as the capture and you don't have to leave the chair in front of the computer. The information you have been waiting fo years is avialable in minutes. I purchased a Kronic 3.5,line and leader on line from uncommoncarp today. Seemed like a great guy to deal with.